​​​Scientifically named Dendrocalamus Asper, giant bamboo produces straight poles with nodes distributed in close intervals along the poles, relative to other species of bamboo. Additionally, the giant bamboo’s culm walls are also thicker and larger in diameter. Consequently, its shearing strength can be up to 4.4 times higher and its flexural strength 7.85 times stronger than other species. It grows five times faster and consumes four times more carbon dioxide than trees; it’s the ideal sustainable construction material. ​​Giant bamboo seedlings were first dispersed by Hineleban Foundation amongst communities of Indigenous People (IP) of Bukidnon in 2008. The act was a form of engagement, meant to build kinship between the foundation and communities. A total of 105 hectares of giant bamboo were planted — each family within the communities had a quarter hectare of giant bamboo. ​​The bamboo proved to flourish in Bukidnon and within the IP lifestyle. As a grass, giant bamboo grows stronger and faster with more water. Bukidnon, with its abundance of rain generated by its forests, allowed it to grow at a prolific rate. It’s structure also acts as a natural barrier preventing soil from eroding and silting waterways, thus preserving the ecosystem within rivers and streams. Furthermore, it is a familiar plant to the IP of Bukidnon. IP communities have been using giant bamboo for centuries as land demarcations, building materials and even general composting. ​​​​As with each TBP Chapter, Hineleban Foundation began the project with thorough market and comparative research to add value to the crop. This began with principals from the foundation attending a Green Village workshop in Bali, Indonesia, to learn the concepts of harvesting, treating and building homes with giant bamboo. The foundation then held a conference with bamboo experts of the Philippines in Bukidnon, during which the group decided on the appropriate market for the volume of the IP’s Hineleban Bamboo harvest. 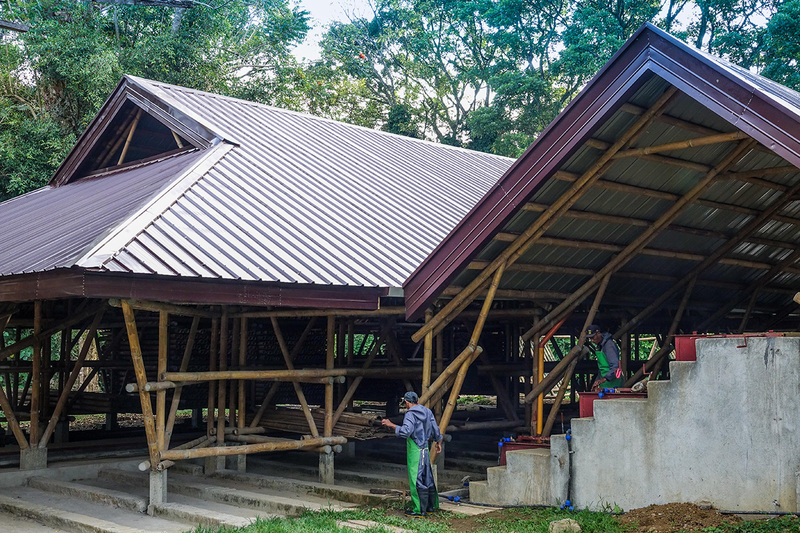 ​​An agreement was reached with BaseBuilds Bahay (BBB), which builds low-cost homes that are resilient to natural disasters and ecologically friendly. Hineleban Bamboo responded to a demand for building these homes, and became a supplier for BBB. ​​Hineleban Foundation then reached out to Bambou Science et Innovation (BSI), a French non-profit organisation which researches and applies innovative treatment for all types of wood, including bamboo. With its extensively researched technology, the BSI process ensures calculated and studied steps for the treatment of giant bamboo as a construction material, with the goal of eliminating any threat of pests that may impede on its life expectancy. ​​​​By 2017, Hineleban Foundation was successfully training IP communities to properly harvest and cut poles in coordination with the foundation’s production process. The foundation also partnered with a bamboo and wood processor for treatment and eventual use in construction. This corporate partner is now responsible for the constant procurement of the cut poles at a much higher and agreed upon price with the IP farmers. ​​​​These poles are then transported to the processing facility for treatment, which applies the technology shared with the foundation by BSI. Once treated, the processing partner then ships the treated bamboo to BBB to construct bamboo homes.